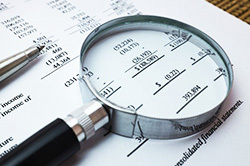 Have you stumbled onto suspicious financial transactions and aren't sure what to do next? We encourage you to take advantage of the forensic accounting services offered by Turner CPA Advisors, PA. As experienced Pensacola, FL forensic accountants we know how to analyze a company's financial records and expose questionable practices and inconsistencies. We can also review personal finances for divorce proceedings to locate unreported income and assets that one party may be trying to hide. Through our litigation support and damage analysis services, we assist attorneys and their clients quantify economic losses in damage suits as well as identifying assets and income streams in matrimonial matters. Our experience spans a wide variety of industries, and we have served as experts in both civil and criminal matters. Call us today at 850-438-4669 and ask for Jeff Turner to discuss your forensic accounting needs with an experienced Pensacola CPA.